Hi everyone. I hope that you are all well and happy. 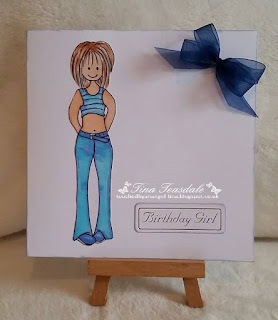 Today sees the start of a brand new challenge over at The Crafters Cafe the theme is CAS ( clean and simple) we have amazing sponsorship as always with fabby prizes so pop over and join us for your chance to win. 5x5 card blank very lightly inked around the edges. Image is from Digi Stamps for joy - "Leggy Lilly -Teen" and she is coloured with a selection of Copics. To finish I simply added a sentiment and an organza bow. who are giving away $10 to spend in the store. This is gorgeous Tina, love the sweet image.